The 28-year-old woman, identified only as Ms He, was pulling out weeds when the insects flew into her eyes. Dr Hong Chi Ting of the Fooyin University Hospital told the BBC he was "shocked" when he pulled the 4mm insects out by their legs. Ms He has now been discharged and is expected to make a full recovery. 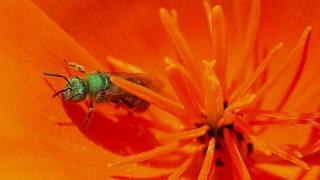 Sweat bees, also known as Halictidae, are attracted to sweat and sometimes land on people to imbibe perspiration. They also drink tears for their high protein content, according to a study by the Kansas Entomological Society. She was visiting the grave as part of the annual Chinese Qing Ming tomb-sweeping festival, which is traditionally observed by sprucing up loved ones' graves. When a gust of wind blew into her eyes she assumed it was dirt that had entered, she told reporters. But hours later, her eyes were still swollen and in pain, leading her to seek medical help at the hospital in southern Taiwan. "She couldn't completely close her eyes. I looked into the gap with a microscope and saw something black that looked like an insect leg," Dr Hong, an ophthalmology professor at the hospital told the BBC. "I grabbed the leg and very slowly took one out, then I saw another one, and another and another. They were still intact and all alive." "These bees don't usually attack people but they like drinking sweat, hence their name," he said. Dr Hong added that Ms He was "lucky" that she did not rub her eyes while the bees were inside. "She was wearing contact lenses so she didn't dare to rub her eyes in case she broke the lens. If she did she could have induced the bees to produce venom... she could have gone blind." But what's happened to the bees? "They are still alive, they've been sent as specimens to another organisation and will be studied," said Dr Hong. "This is the first time in Taiwan we've seen something like this."